No other energy project has galvanized Chileans to action like HidroAysén–a proposal to build five dams on the pristine Baker and Pascua rivers in the Patagonia region. It has already triggered numerous debates and changes within Chile, and the final decision on the project, which will be made in less than one month, will continue to have far-reaching consequences beyond the dams themselves. While HidroAysén is already affecting change, the final ruling on the legality of the project’s approval could set in motion vastly different courses for Chile. One that allows for more megadams and mining in Patagonia or one that leads to considerable environmental reform. Editor’s note: Readers who’ve seen 180° South will be familiar with this issue. Read on for an update on the dams, and then please consider taking take action at the end. Leading up to the presidential election, frontrunner and former President Michelle Bachelet made strong statements against the viability of HidroAysén. 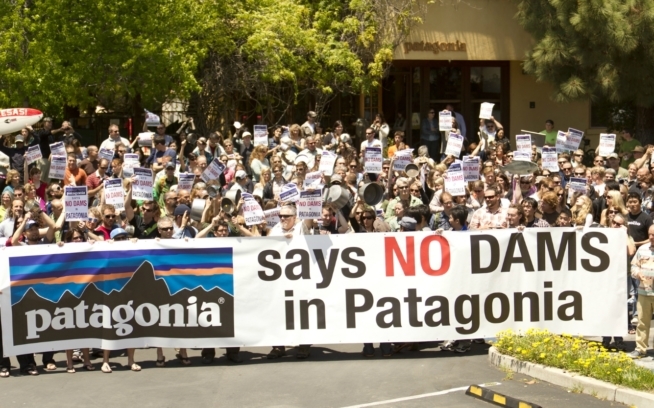 Her comments were followed by the announcement on January 7 that Endesa Chile, the majority owner of HidroAysén, removed the massive hydroelectric project from the list of active projects it presented to investors at the end of 2013, citing legal challenges and uncertainty surrounding the dams’ transmission line as reasons for this exclusion. The company quickly released a statement saying that is has not abandoned the project. However, the initial news sent shock waves of hope to activists. On March 19—just eight days after taking office—the new Committee of Ministers under President Bachelet announced its resolution to invalidate the decision made by the Piñera administration in late January (to request additional studies to evaluate the impact of the dams) citing “illegal defects.” The Minister of the Environment, Pablo Badenier, announced that the Committee will not request additional studies but rather make a definitive ruling on the project’s environmental permit as it stands within 60 working days. International Rivers, along with our partners in the Consejo de Defensa de Patagonia (CDP), are hopeful and confident that the administration will respect the 60-day deadline and cancel the project on or before June 10 (60 working days from the announcement). If appeals to the project are rejected and its environmental approval is upheld, many more megadam projects in the pipeline will likely be given the green light along with HidroAysén’s 1,180-mile-long transmission line. Two megadam projects on the Río Cuervo and the Futaleufú anxiously await the decision by the Committee of Ministers that will influence how they move forward. Proposed dams on the Río Cuervo and Futaleufú would likely utilize HidroAysén’s proposed transmission line to deliver energy to the northern part of the country where it’s needed. While an EIA for the transmission line has yet to be submitted, it will surely follow if the dams’ approval stands. Endesa, which owns the water rights to the Futaleufú River, has mentioned plans for three dams on the river to investors and in company documents, although no EIA has been submitted. Organizations on the ground including Futaleufú Riverkeeper are working to provide legal support and mobilize community members in case the project does move forward. The Río Cuervo Dam received its environmental approval in May 2012 under President Piñera. However, opponents appealed the decision claiming that the environmental permit was not legal. On April 4 of this year, a Chilean appeals court gave the green light to the US$733 million project ruling that the EIA met all necessary requirements—but the fight isn’t over. Environmental groups have appealed to the Supreme Court and are hopeful they will be successful in opposing the project. In sum, HidroAysén would open an electrical highway that could lead to the approval of other dams further north to expand the system. In addition, as the first industrial-scale project in the region, approval would open the region to further exploitation including mining. Alternatively, putting an end to HidroAysén would send a strong signal that these kinds of destructive projects will not be tolerated in Patagonia. Combined with water rights reforms already underway, there is an opportunity to legally protect Patagonia for the long term. One group, Ríos to Rivers, is working to establish parts of Patagonia as UNESCO World Heritage sites to promote their long-term protection. In addition, my colleagues in the Consejo de Defensa de la Patagonia (CDP) hope to establish a law that would protect all rivers and surrounding areas in Patagonia from dam and mining threats similar to the protections in the Wild and Scenic Rivers Act in the US. If the project is rejected, it is always possible that HidroAysén will redesign and submit a new EIA. However, the momentum against the project may be insurmountable. I strongly believe that we are on the brink of victory, thanks to the efforts of thousands of people around the world who have been making their voices heard for many years. I am hopeful that changes on the horizon will prevent projects like HidroAysén from seeing the light of day and protect Patagonia for generations to come. Please add your voice and send a letter to President Bachelet asking her to cancel the project once and for all. Rios Libres is a team of adventurers, photographers, writers, filmmakers and scientists working to keep Patagonia wild. Since 2010, they’ve been developing empowering, inspirational films and media, documenting the stunning beauty of pristine Patagonia, and tipping the scales in favor of conservation.